Emily Fagan is not shy talking about mental health. Last year, students began coming to her almost weekly to discuss their struggles with mental illness. “They all said, ‘I feel so alone. I feel like no one understands. I feel like no one else is going through this,’” the Bienen junior said. Fagan, who has bipolar disorder, generalized anxiety disorder and attention deficit hyperactivity disorder, assured the students they weren’t alone. 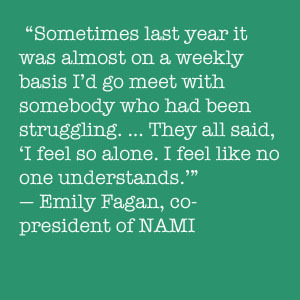 After hearing from many who felt isolated coping with their psychological problems, she decided to start a support group through the National Alliance on Mental Illness at Northwestern. 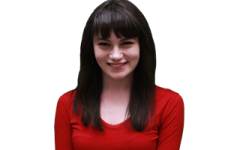 Fagan is not the only student taking steps to improve mental health resources on campus. After three student deaths shocked the NU community last academic year, students and administrators began advocating for better mental health resources on campus. From increased staffing at Counseling and Psychological Services to the creation of a new mental health Essential NU during Wildcat Welcome, pressure to enhance mental health programming last academic year has already produced tangible results. However, CAPS struggles with budgetary constraints and remains understaffed. Many students still do not think the organization meets the needs of those with mental illnesses. The student group NU Listens continues to seek University approval and funding for a dedicated adviser, and organizations all over campus are looking to reduce the stigma surrounding mental illness. Both NU Listens and NAMI have also run into liability issues with the University that could prevent them from making progress at all. By facilitating conversation about mental illness, administrators are concerned the groups could be held responsible if students in the groups harm themselves, NAMI co-president Supriya Bharati said. Although activists have lofty goals for psychological services on campus, the community has a significant amount of work to do before mental health at NU looks the way they envision it. 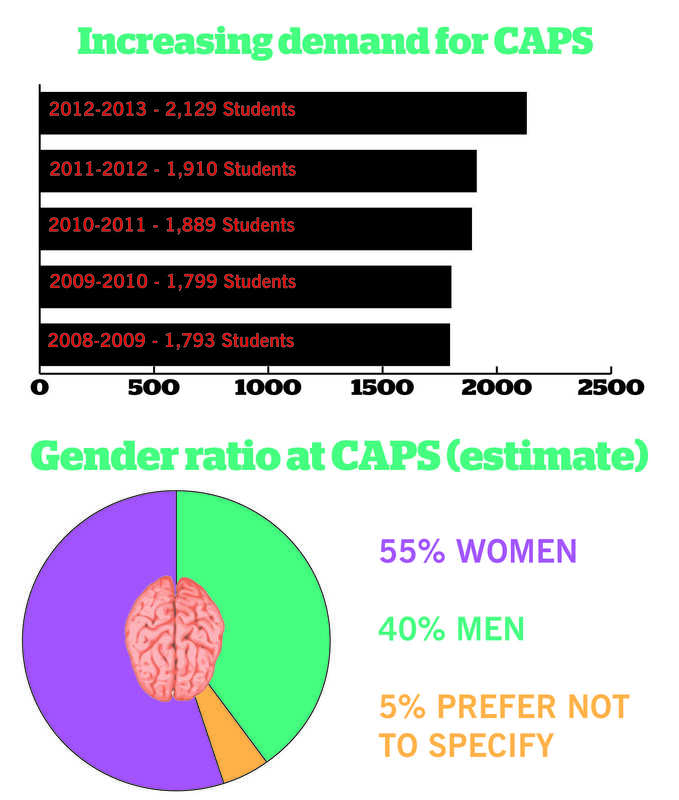 The number of students requesting help from CAPS has steadily risen over the past five years. CAPS has seen a 20 percent increase in students seeking its services since 2008 and a 12 percent increase from 2011 to 2012, according to internal records. 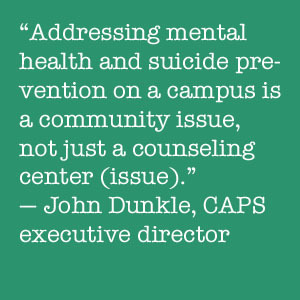 CAPS executive director John Dunkle said the trend indicates students are becoming more comfortable addressing their mental health problems. Dunkle said the jump from 2011 is likely due in part to the three student deaths NU saw last year. Weinberg junior Alyssa Weaver committed suicide last November while studying abroad in London, and McCormick sophomore Dmitri Teplov committed suicide in May in Pancoe Hall. McCormick sophomore Harsha Maddula was found dead in Wilmette Harbor last September. His death was ruled accidental, but it sent shockwaves across campus. In addition to prompting more students to seek services, however, Dunkle said the tragedies also spurred students to get involved. “One of the things that came out of last year was that a lot of students got activated in a good way, really trying to think of ways that we can address suicide prevention and mental health services,” he said. Despite what Dunkle sees as improvements, he and many mental health advocates on campus say more can be done to make people feel comfortable about coming forward with psychological problems. By working to start a chapter of NAMI at NU, Fagan hopes to create a place where students can talk to others facing similar problems. Naina Desai, co-president of NU Active Minds, said she wants to see students’ comfort discussing mental illness expand even further, to the point where mental health becomes part of everyday conversations on campus. The inaugural mental health ENU, held Sept. 22, closed to a standing ovation from an audience of new students and peer advisers. The presentation, required for all new students, included an overview of NU’s mental health resources and a speaker who shared his struggles with depression and suicide. CAPS is already seeing the impact of the ENU. At least five students told CAPS they made an appointment because of what they heard during the presentation, Dunkle said. The other major change to CAPS this year — the addition of three new psychologists, two of whom have already been hired — has improved the organization’s student-to-doctor ratio. Last academic year, the Undergraduate Budget Priorities Committee announced the University would fund three new positions: two requested by CAPS (a psychologist to focus on Latino students and another to lead the Question-Persuade-Refer suicide prevention training program) and a third requested by the athletic department to support student athletes. Now that CAPS has hired Monika Gutkowska to oversee the QPR program and Lori Jeffries (SESP ‘05) to work with student athletes, the CAPS faculty-to-student ratio is 1 to 1,000, bringing NU closer to the average ratio for peer institutions, which is about 1 to 945. With a bigger staff, CAPS is expanding its efforts to reach as many students as possible, Gutkowska said. “Most students do not come to counseling services when they really need help, especially … students who come from underrepresented groups or students who feel a little shy about entering our door or have preconceived notion about what counseling is,” Gutkowska said. The QPR program Gutkowska now leads is working to aid those students. The program has trained about 1,600 NU community members since its implementation last academic year. QPR training represents a vital part of CAPS’ strategy for earning a seal of approval from the Jed Foundation, an organization that promotes mental health and suicide prevention on college campuses. This year, the foundation awarded 30 colleges the JedCampus Seal, signifying they had met requirements for improving mental health and suicide prevention. When CAPS hires the third new psychologist, who will specialize in the mental health of NU’s Latino population, NU’s ratio will reach 1 to 980. The third psychologist will join doctors already working at CAPS who work with other minority groups on campus, including students in the Asian, black, and lesbian, gay, bisexual and transgender communities. Weinberg junior Theo Cunningham said she was surprised to learn NU lacked a peer listening service when she transferred to NU in 2012 from Washington University in St. Louis. “Because it was such a prominent force on campus at Wash U, I assumed every college campus had one,” she said. Despite the addition of the new psychologists, CAPS and NU Listens, a group looking to start a peer listening service at NU, are both still waiting for the administration to grant their request for two more. However, the funding for the three new psychologists does not cover two positions CAPS initially requested, one of which would work with NU Listens to train students to be a part of a peer listening service. 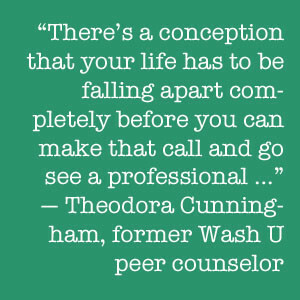 While at Wash U, Cunningham worked for Uncle Joe’s, the school’s peer counseling service. She said a similar program at NU would bridge a gap in mental health services that CAPS does not fill. Dunkle said he still wants to see the University provide funding for a psychologist to work with NU Listens. Although the administration has not agreed to fund a psychologist to work with the group, in the meantime Dunkle and NU Listens are partnering to create a pilot peer listening program. NU Listens executive members say they hope to have the pilot running by Spring Quarter, even without a new CAPS staff member dedicated to working with them. They plan for the program to launch in two dorms and provide confidential peer listening sessions. However, the group still needs to clear up liability issues with the University before it can proceed. 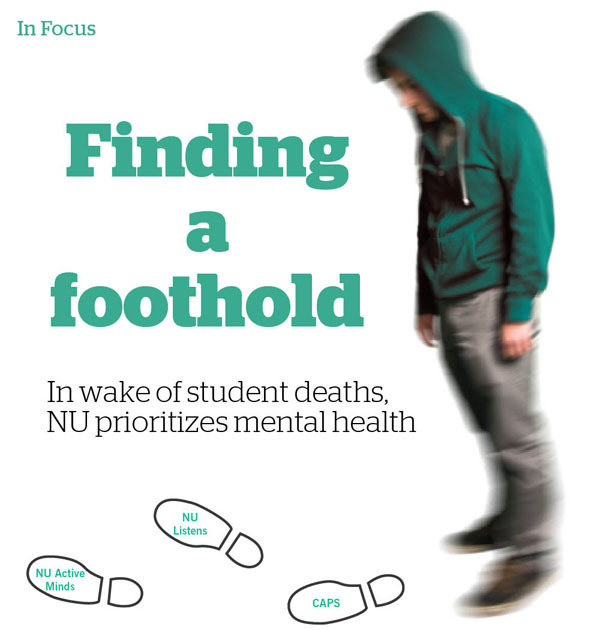 Because NU Listens, like NAMI, will encourage students to talk about their mental illness, the group could be held responsible for students’ deaths if they come to a session and reveals suicidal intentions, said Leah Grodinsky, co-president of NU Listens. Those working to start the NU Listens pilot and NAMI support groups see the benefits of encouraging discussion about mental illness as outweighing liability issues. Initially, CAPS also requested a psychologist who would implement a long-term treatment option. NU currently offers students 12 free sessions before referring them to outside resources. Some say CAPS desperately needs long-term support. She said CAPS did not provide much help in determining when she should return to school. Although she had not used all 12 free sessions, she said the center did not allow her to return for treatment after arriving on campus last fall. “When I came back, support through CAPS was not presented as an option transitionally, which I think it really should have,” she said. She added that though CAPS gave her a list of doctors in the area, it did not help her determine which doctors would be covered by her insurance. She isn’t the only student who has complaints about CAPS services. Bharati said her own experiences going to CAPS for her depression left her dissatisfied with the organization. Dunkle said he wants to improve the resources CAPS provides to students who require long-term help — and to make it easier for all students to schedule CAPS appointments. Mirroring efforts by administrative and student groups to improve mental health resources, Associated Student Government is facilitating collaboration among campus organizations. When too many groups put on events with similar aims, attendance at each tends to be disappointingly low, said Alex Van Atta, ASG executive vice president. CAPS, NU Listens, NU Active Minds and the new NAMI chapter are among the groups ASG has united this year, coordinating their events to reach a broader audience. In November, ASG will launch a new campaign spreading mental illness awareness called “Greater Than,” which was announced at the Senate meeting last week. The initiative will feature posters with pictures of students and a statement of their accomplishments showing they are “greater than” their mental illness. The campaign will lead up to Stigma Panel, an annual event hosted by NU Active Minds during which students with mental illness discuss their experiences. Although NU Listens is still waiting on another new psychologist, Grodinsky said she thinks the group’s pilot program will be successful — provided the group receives administrative approval. “We’re optimistic, but we don’t want to sound overconfident,” she said. Dunkle said he sees the collaboration between CAPS and NU Listens as a model for successful mental health programming. “Addressing mental health and suicide prevention on a campus is a community issue, not just a counseling center (issue),” he said. All the changes are intended to make campus safer, healthier and more supportive. Fagan hopes to help achieve that goal with the support groups once they receive University approval. CAPS and mental health at NU in general, Dunkle said, will never run out of ways to improve.